PROJECT SUMMARY: Southern Lights had the privilege of creating the lighting designs for this property and work with the client who was particularly interested in a full service design build installation including the landscaping, hardscaping, an on-going maintenance. This meant combining forces with Southern Exposure Landscape Management and Southern Lights. Built-in 1929 by Julian Price, founder, and president of Jefferson Standard Life Insurance Company, The Julian Price House also know as Hillside is a house like no other. Designed by Greensboro star-architect, Charles Hartmann, the home is a mix of Downton Abbey and Southern Living Magazine. The 31-room mansion is marked to be one of the grandest Tudor Style homes in North Carolina. Every room was designed to be just as elegant as the next. The landscape is equally detailed, containing stone retaining walls, serpentine flagstone walkways, and mature evergreen feature trees. But over the past decade, the home and landscape have deteriorated. The damage reached a climax last year when the home was featured in A&E’s infamous T.V. show ‘Hoarders’. Over 1.2 million households across the country watched the heavy-wrenching episode unfold as the ‘Hoarders’ T.V. crews emptied the enormous home, packed from floor to ceiling with contents accumulated by the former owner. The landscape was also left in shambles. But since then, things have drastically changed. The home was bought by Michael and Eric Fuko-Rizzo last year. Who have tasked Southern Lights with restoring the architectural and landscape lighting. LIGHTING FOCUS: Illuminate Historic Architecture of Home and Provide Adequate Lighting for Safety as the Home plans to have thousands of visitors interested in seeing the transformation. LIGHTING DESIGN: Ideal landscape lighting should evoke Safety. Security. SERENITY. and should always start with a design. Building off the landscape design provided by Chip Calloway & Associates, Pete Bryant (COLD, Certified Outdoor Lighting Designer) of Southern Lights of NC designed the entire lighting system for the several acre site to be done in phases. Currently the site has completed phase 1. LIGHT FIXTURES: 100% Made in the USA Clarolux Landscape Lighting Fixtures. Clarolux- WL3 “Belmont” PAR36 Well Lights, Clarolux- WL16-FTIII “Starmount” MR16 Well Lighting, Clarolux- BL21 “Tivoli” Compact Directional, Clarolux- AL1 “Barletta” Copper Area & Path Light, Clarolux- WFL26 “Charlotte” Wash Light, and Clarolux- TL24 “Venice-II” Copper Tree Light. HURDLES TO OVERCOME: Designing an ideal landscape lighting system takes planning. The design and installation of Hillside’s architectural and landscape lighting was met with a few hurdles. Worked within historical preservation guidelines to make sure the home and property stayed true to its original form. With over 100 tradesman in and out of the home consistently, working in and around others schedules and scope of work was sometimes a challenge. By far the biggest challenge for both the landscaping and the lighting was the ongoing winter weather this Spring and consistent rain. 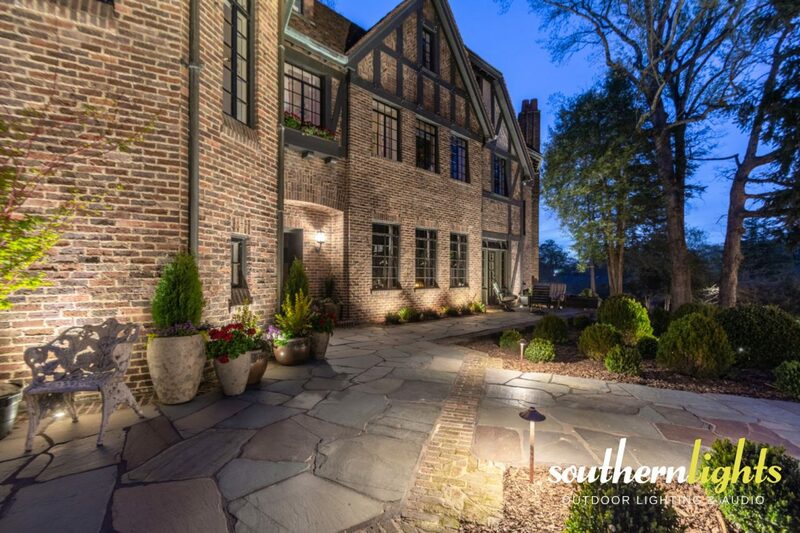 This client trusted Southern Lights with the lighting designs allowing us to provide the the most ideal landscape lighting effects with the best lighting fixtures for the space and structures.